The L350 is our leading oceanographic LED floodlight and ROS's most robust to date. With 7,500 lumens illumination and independently tested to 6G shock and vibration the L350 is ideal for harsh environment subsea operations including WC-ROV operations and deep-sea trenching projects. Manufactured from hard anodised 5K aluminium, the L350 utilises a captive flush mounted window and recessed tamper proof screws, while faces of the housing meet with large radii mitigating corrosion, chafe and snag points. Structural integrity is further enhanced with the view port secured in place by a ‘cleated’ bezel and housing interface removing the shear loading on the ports retaining fasteners. 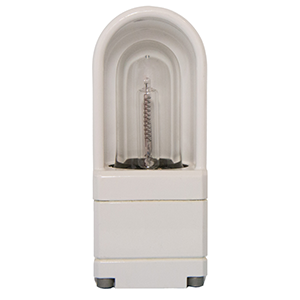 It features smooth full range dimming from zero to max, 6,000 meter depth rating, 120 VAC or 24 VDC power. The L350 has a 2-year warranty and various connector options. The L300 is our leading edge oceanographic LED flood or spotlight with 7,500 lumens illumination. Independently tested to 6G shock and vibration the L300 is ideal for harsh environment subsea operations including WC-ROV operations and deep-sea trenching projects. It features smooth full range dimming from zero to max, 6,000 meter depth rating, 120VAC or 24VDC power, aluminium housing, and is a direct replacement for our QLED lights. The L300 has a 2-year warranty and various connector options. The Q-LED III is an oceanographic floodlight featuring 120/220 VAC power, 4,000 meter depth rating, 80° beam angle and aluminium housing. The Q-LED III has a 1-year warranty and various connector options. Designed for subsea ROV operations, the Q-LED III is is the latest version of the market leading Q-LED underwater light series. The QL-3000 is an oceanographic LED light with 10,000 lumens illumination. It features a 6,000 meter depth rating, 130 VAC power and aluminium housing. With thousands of units supplied worldwide the QL-3000 has been deployed on countless subsea oil and gas, marine renewables, marine exploration and marine construction projects. The QL-3000 has a 1-year warranty and various connector options. The MV-LED II is an oceanographic LED spotlight with 1,500 (AC)/ 3,100 (DC) lumens illumination. It features 6,000 meter depth rating, 120 VAC or 24VDC power and hard anodised aluminium housing. The MV-LED II is the ideal spotlight for subsea ROV applications. The MV-LED has a 2-year warranty and various connector options.